Translation of Marko Kantaneva´s 1997 publication “Sauvakävely” Reference of content from April 1997. 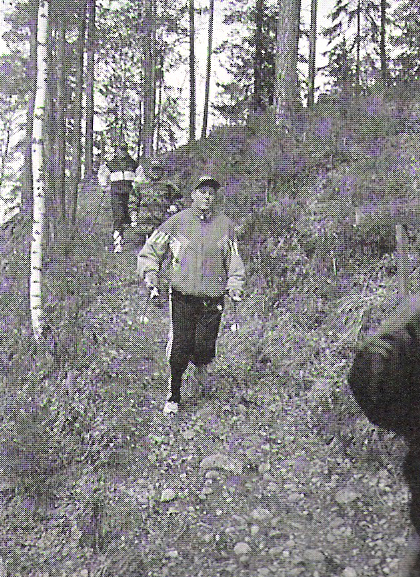 It’s a well known fact that cross country skiers have used ski poles for a long time as part of their summer conditioning because with poles it’s possible to do an exact imitation of a classic cross-country skiing technique going uphill. 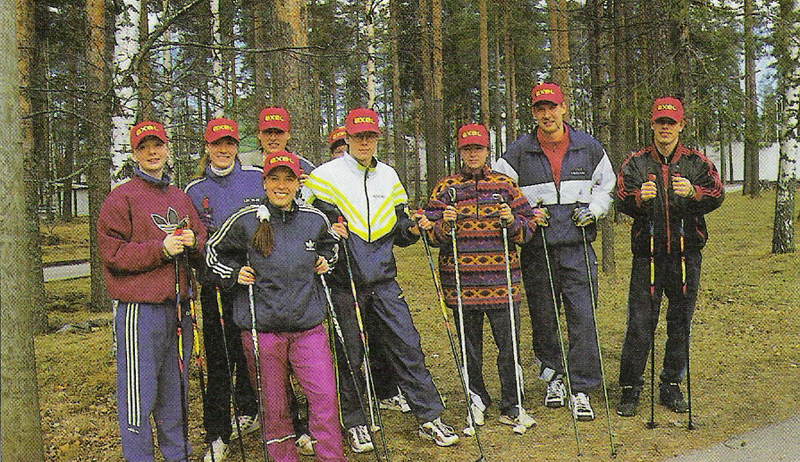 With poles skiers have done long hikes in the fells and in the forests of Lapland; training by bounding and running uphill and doing very hard special high intensity exercises on swamps with a backpack filled with stones. For ordinary people in search of general fitness and conditioning there is no need to do such types of very intensive sporting exercises in order to be able to achieve excellent results from training with poles. Actually, anyone can easily find a suitable and comfortable level of pole walking in order to have a highly effective, fun, but at the same time a very functional all-in-one outdoor exercise. Walking with poles gives a really new opportunity to simultaneously achieve respiratory and cardio-vascular fitness and muscle conditioning all at the same time and in just one outdoor exercise session! It’s also my experience that the secrets and benefits of walking with poles immediately become clear for those who have tried it and it’s also clear that there will be a huge boom in Nordic walking in the near future – in our country and worldwide – when the word goes out. For some, the idea of walking with poles as being a serious outdoor exercise method, and especially for the very first time, seems to be a big mental threshold to get over because the whole thought is so funny (almost ridiculous – too easy). Me – walking with a poles in the middle of summer? Its very hard to imagine oneself taking a pair of poles to go and walk in public on the roads, in parks, forests and sidewalks with a look on the face that says ”Hey it might look funny but its good for you”. In reality its better to be prepared for comments like: ”Have you lost your skiis (mind)?” – ”I saw your skiis earlier today – they were going in that direction by themselves (hahaa)” – ”Hey, winter is gone already neighbour! (more laughing)”. However, the Nordic walker doesn’t need to worry because barking dogs never bite. Instead, the proud Nordic walker can just go on with a smile and be consoled with the thought: ”My physical condition is getting better and better with every single step I take and push I make”. 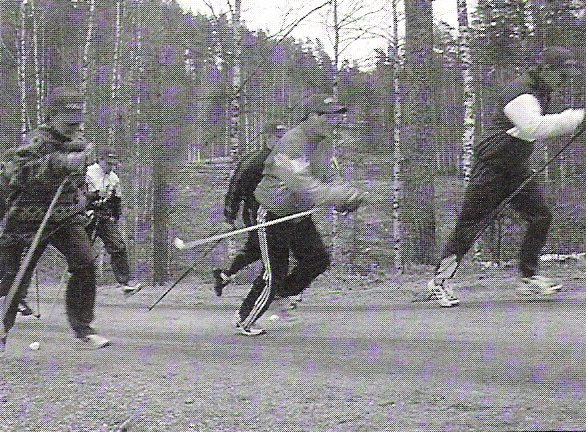 It is clear that in Nordic walking the poles should be shorter than the length of those used in the classic cross country skiing technique. This is because there are no skiis or depth of snow under the walker´s feet (poles) during the walking action. Also with poles and using a normal walking action it is not possible to do as long a stride, or to slide, as is possible with skiis on a ski path. From the point of view of a person who is in average physical condition the best way to obtain suitable poles for Nordic walking is to visit a sports shop or department store sports department. For Nordic walking use there is no sense in choosing the best available cross country ski racing poles. A suitable price level for ski poles for pole walking use is around 200 Finnish marks. When walking in the summer time on forest paths it might be beneficial if the poles used have a similar spiketip like that used on alpine and trekking poles. Those have a crown type of spiketip and a smaller basket than is normally used on cross country ski poles. With this type of alpine or trekking pole spiketip and basket it is possible to avoid the problem which happens with a sharp cross country ski pole spike tip. A cross country pole spike tip picks up leaves, twigs and other trash. To protect the floors when storing the poles at home or to make walking with poles on asphalt a ”softer” experience it would be a good idea to use a kind of rubber plug over the pole spiketips. After the asphalt part of the route ends the rubber plug is easy to take off in order to continue walking on forest paths just with a spiketips. The pole lengths presented in the table ”Original length criteria of Nordic walking poles” above are based on long term field testing and experience and have been found in practice to be generally well suited for people when comparing the pole length (cm) to their height (cm). Ski poles are available for people shorter that 150 cm or taller than 2 meters. A person shorter than 150 cm should use a ski pole 5 – 10 cm shorter than the minimum length mentioned in the table. A person over 2 meters tall should use 5 – 10 cm longer ski poles than that mentioned as a maximum length in the pole length table. Of course, in the end everyone can decide for themselves the length of ski poles they like to use for Nordic walking. What kind of training is Nordic walking? In Nordic walking the training effect is very comprehensive because, in a walking action – just like in a cross country skiing action – all the main muscle groups are in use. To put it simply – the legs and hips will get active partnership from arms and upper body muscles during the walking action. This tiny detail – to add the upper body muscles in supporting the walking action – thereby making it a more comprehensive and effective total body workout – increases pole walking training effect by up to 40% when compared to walking without poles. In practice this is significant for people who are looking for an effective but easy going exercise form. There is no need to increase walking speed; but with a pair of poles in the hands you will get much more of a comprehensive exercise which will improve respiratory and cardio-vascular fitness and muscle condition – all during one exercise. 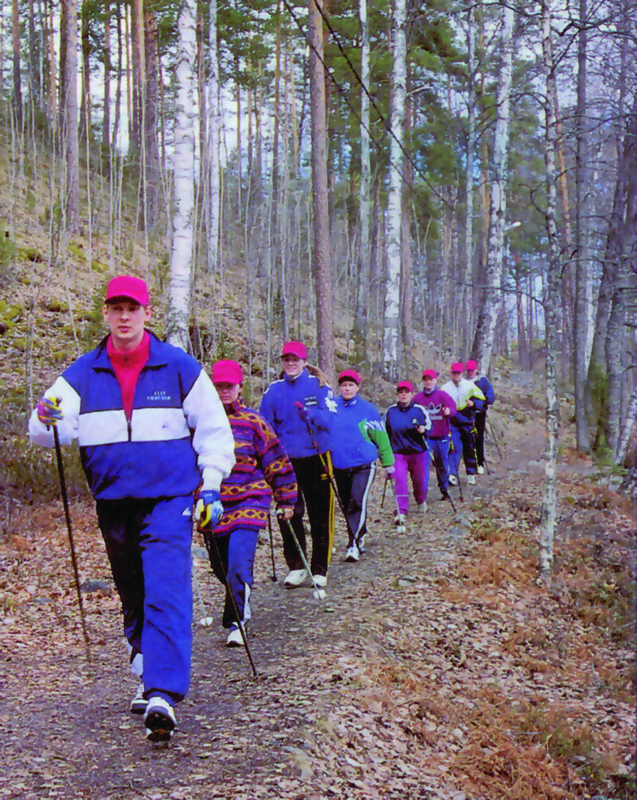 Nordic walking technique is very similar to classic cross country skiing technique. It’s easy to master the basic rhythm of Nordic walking after a short period because the rhythm and movement is very natural and follows a similar pattern to a walking and running rhythm. It is important in Nordic walking that the arm movement should allow the grip of the pole to always move from back to front so that the fists leads the arm from behind to the front, and from the front to the back with both arms acting alternately. When pushing, each pole will find its natural angle. So when the front arm (right) is bent to about a 90 degrees angle and the pole tip is placed into the ground the tip is then level with the rear foot – and then the angle of pole to the ground is about 75 degrees – and the rear arm (left) and leg is stretched oneselves to toe and pole push. The main thing is that you never throw the pole tips to front first which makes Nordic walking in a view of arm/pole work very tense and will lead to missing of all power from pole push. 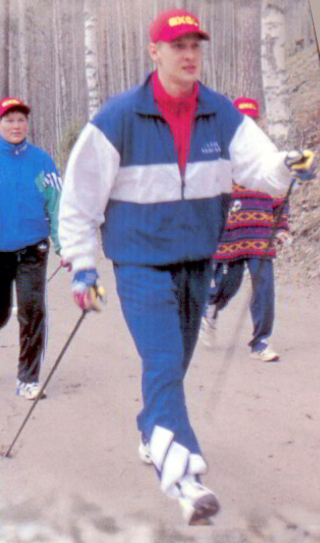 Practice has shown that there is no reason to pay too much attention to technique details because Nordic walking movements are very natural. Actually the same as at age 6 months when you last crawled on the floor. It’s a good hint to remember that arms and legs should move in a similar way and rhythm as they do in a normal fast walking action (long stride and arm work). There is only the need to add to the walking action the pole plant to the ground, the pull of the pole and at the end of the arm movement, the push of the pole. In these three phases it is also good to remember not to grip the pole too tightly and to release the palm of the hand just a little against the pole straps at the end of the each pole push to create a longer stride. After a short time the movements of Nordic walking will come more fluid and relaxed. Practice has shown that after a short introduction people will find the natural and correct rhythm fairly quickly. You just don´t need to try and think too much – let it flow. The basic form of Nordic walking training is a long lasting endurance type of walking. Four feet walking. This type of exercise session should last from 30 minutes up to two hours depending ones level of physical conditition. The level and pace of pole walking exercise should be moderate, say heart rate 120 to 150 beats per minute. If you are not able to measure heart rate with a heart rate monitor, it is possible to use instead the rule of NAS (Need to be Able to Speak) to make sure the correct individual exercise exertion level is reached but not exceeded. The best terrain for Nordic walking training is a mixed type of terrain but should not include very steep hills. However, the natural variation of terrain will make Nordic walking training both great fun and also be functional. On a flat part of the track you can increase your stride length assisted by longer pole pushes. Going uphill you will experience a new feeling of ”four wheel drive” – thanks to strong arm work – and on the downhill you can jog to relax and allow your muscles to recover from hard exertion. When beginning Nordic walking, especially if you know that your physical condition is not in the best possible shape, it’s better to select training paths in flat terrain, like asphalt roads or parks, than from very steep cross country paths. Step by step – together with improved physical condition, you can pick up steeper paths where to do your Nordic walking training sessions. 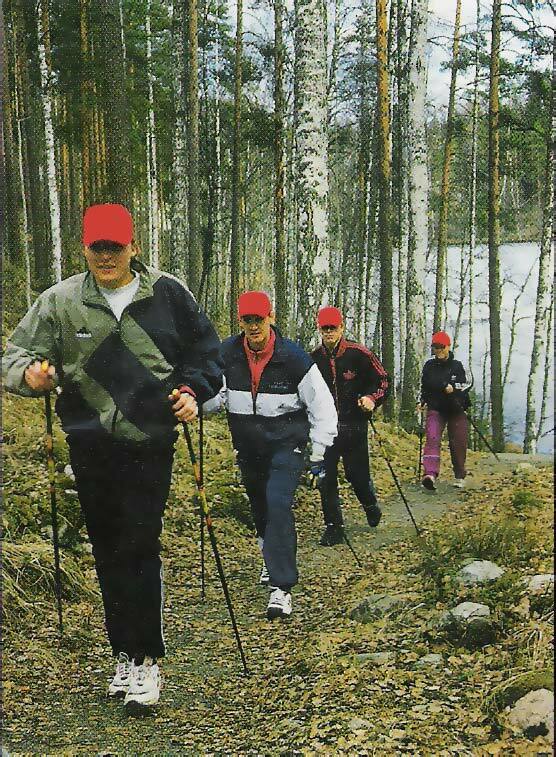 The moderate exercise level in Nordic walking is suitable for most ordinary people (not fitness crazy). Simply, it is ideal for those who are in need of regular outdoor exercise which will fullfil the training needs of the respiratory and cardiovascular systems and muscles all at the same time in one session. 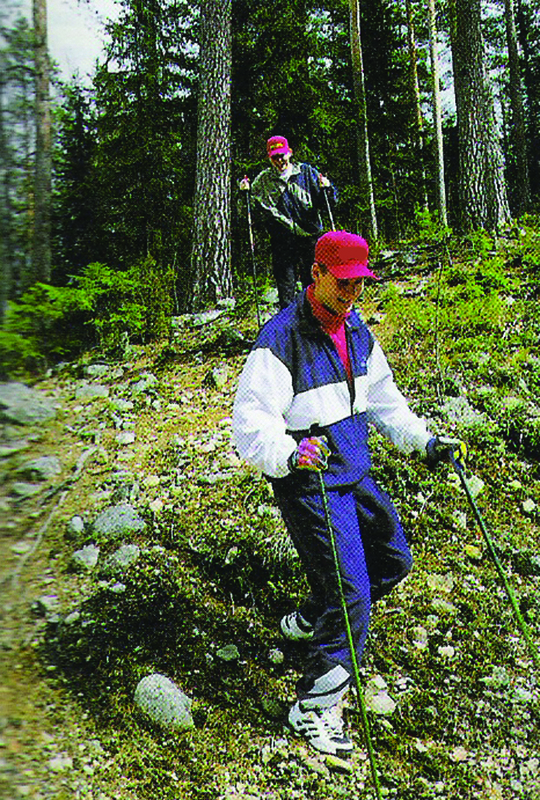 If you are looking to improve your fitness and performance level, for example towards long distance skiing events in the winter time, like the Wasaloppet or similar, then Nordic walking special uphill exercises are the most suitable training for you. Remember, the following two exercise examples uphill training and bounding with poles are more suitable for those with a high level of fitness. Uphill training with the poles will be ”against the clock”, for example over 30 minutes. Then it does not matter how long the uphill section is. In uphill training all that is to continuously keep on walking up the hill and then jogging or walking down in a relaxed way. When walking up the poles should be used very powerfully – using poles (arms) like a second pair of legs. Instead of just walking fast you should be pulling and pushing yourself with the poles up the hill. Once you have reached the top you should turn back down again. On the way down walk or jog to allow recovery from the exertion the uphill ”four feet walking” has caused you. The uphill training with the poles will improve performance ability, aerobic endurance force and recovery metabolism. To be able to do uphill training exercises you should be at least in a fairly good shape – beginners should remember that the heart rate will raise very quickly in an uphill training session. Bounding with the poles uphill should be done after a very careful warm up session – for example after 15 to 20 minutes of rapid Nordic walking. The uphill should be quite short – lasting about only 20 to 60 seconds on each run. The steepness of the hill should allow easy jumping with the poles from the starting point to the top and also be easy to jog or walk down again afterwards. It is best if the path is clear so that there would not be any possible risks of hurting yourself when jogging back down from the top. The uphill bounding with poles is supposed to be like in winter time with cross country skiis using ”herringbone jumps”. Its also possible to go uphill by running with the poles if its too hard to find the rhythm of leg and arm work coordination whilst bounding. The speed is not important, but use careful arm, leg and footwork with each push and bound you make. When you are back at the starting point take a short easy pole walk for 2 or 3 minutes to cool down before you start bounding up again. Bounding with the poles routines should last from 20 to 60 minutes in total depending on your physical condition. Bounding uphill with the poles improves anaerobic condition and makes ”cross country skiing muscles” – arms, buttocks, legs, back and abdominals stronger. Remember: Uphill exercises are suitable for persons who are already in a good shape and are looking for a more competitive athletic fitness condition. It’s possible to cure painful leg muscles, joints and bones after a hard training session or after a long working day with Nordic walking on a swamp or soft forest ground. The exercise has to be at a very low tempo and be easy. This type of exercise should last around a maximum of half an hour. On a swamp, quiet and calm Nordic walking is very comfortable because the muscles and bones will not get tired from those ’hits’ they normally take with every step and pole push. Quiet and calm Nordic walking on a swamp or soft forest ground is a perfect way for the whole body to recover from the hard physical and mental exertions of the day. Hint: On a swamp it is also possible to do an exercise similar to uphill training, but on a swamp or soft ground the joints, muscles and bones will not exhaust so completely because the ’hits’ the legs and arms take are much softer. Everyone should at least once go and try this new way to improve respiratory and cardio-vascular fitness and muscle conditition all in one comprehensive exercise. So, put your walking shoes on your feet, take your poles from the winter closet and go out to have a Nordic walk. Head off in the direction of park or forest paths swinging your poles and smiling in the spring sunshine and enjoy ’four feet walking’ ( tsup – tsup – tsup…). Text: Written & Translated by Marko Kantaneva and edited by Malcolm Jarvis.